During August 1972, Deep Purple were touring Japan. Deep Purple’s reputation preceded them. Their penchant for the rock ’n’ roll lifestyle was legendary. Chaos and carnage was omnipresent as Deep Purple toured the world. That’s why Deep Purple were referred to as the third member of the “unholy trinity of British hard rock and heavy metal.” Led Zeppelin and Black Sabbath were their main rivals for the crown of hardest living and most successful heavy metal band. Although Deep Purple had only been formed in 1968, they’d already released six albums. From their 1968 debut album Shades Of Deep Purple, commercial success came Deep Purple’s way. America and Britain were won over by Deep Purple. That’s why Deep Purple were touring Japan in August 1972. Their Machine Head World Tour was scheduled to last the rest of 1972 and into 1973. On the 15th and 16th of August 1972, Deep Purple took to the stage in Osaka. Then on 17th August 1972, Deep Purple landed in Tokyo. These three concerts were recorded and became Made In Japan. It was released in December 1972 in the UK and April 1973 in the US. This further reinforced Deep Purple’s reputation as one of the greatest heavy metal bands. Since then, Made In Japan, which was recently rereleased as a double album, has attained legendary status. Made In Japan was critically acclaimed upon its release in 1972. Critics hailed Made In Japan as one of the finest live albums ever. Forty-two years later, that’s still the case. That’s why Universal rereleased Made In Japan. 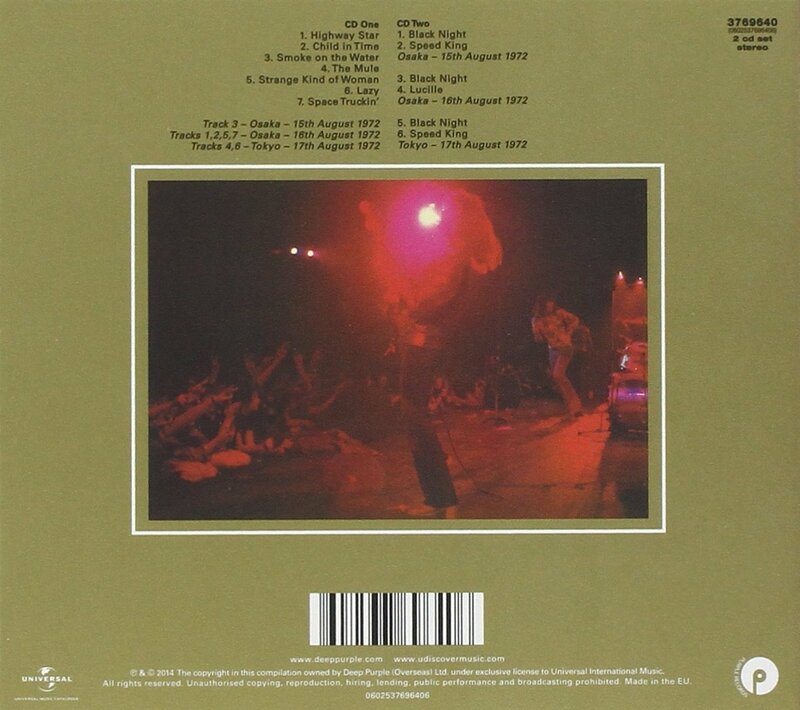 Disc one features the original seven track album. It’s been digitally remastered from the 1972 analogue stereo master. Then on disc two, there’s a further six bonus tracks. Disc two features the encores from the three nights in Osaka and Tokyo. Just like the original concert on disc one, the encores feature Deep Purple at their hard rocking best. Each night, the encore began with Black Night. Closing the shows on the 15th and 17th August 1972 were Speed King. On the 16th August 1972, Deep Purple bid their farewell will a version of Lucille. As they leave the stage, it’s obvious that the audience want more. If they’d had their way, the audience would have had Deep Purple play their entire back-catalogue. That’s how popular they were in 1972. It was very different when Deep Purple released their debut album four years previously. Deep Purple were formed in 1968 in Hertford. However, the story begins in 1967. That was when ex-Searchers drummer, Chris Curtis, contacted London based businessman, Tony Edwards, with a business proposition. Chris wanted to create a supergroup which he would name Roundabout. The idea behind the name was that the lineup was fluid. Members would come and go, on what was akin to a musical roundabout. Tony Edwards liked the idea and brought onboard Jon Coletta and Ron Hire. They named their new venture Hire-Edwards-Coletta (HEC) Enterprises. Now with financial backing, Chris Curtis started putting together Roundabout. The first member of Roundabout was Jon Lord, a classically trained organist. He’d previously played with The Artwoods. Guitarist Richie Blackmore, who recently, had been working as a session musician is Hamburg auditioned. He too joined Roundabout. So did bassist Nick Simper, whose most recent band was The Flower Pot Men. Nick was a friend of Richie Blackmore. The two other members of Roundabout were also friends. Rod Evans was recruited as the lead vocalist. Previously, he was a member The Maze. Their drummer was Nick Paice. Nick became the final piece in the jigsaw. However, he was not the first choice drummer. Originally, Bobby Woodman was meant to be Roundabout’s drummer. He was drummer when Rod Evans auditioned as vocalist. Richie Blackmore had seen Nick Paice playing before. Although just eighteen, Richie knew Nick Paice was a good drummer. So when Bobby headed out to buy cigarettes, Nick Paice was auctioned. Instantly, everyone realised Nick Paice was a better drummer. When Bobby returned with his cigarettes, he was no longer Roundabout’s drummer. However, at least Roundabout’s lineup was settled. Or so people thought. Roundabout were kitted out with the finest equipment and lived at Deeves House in South Mimms, Hertfordshire. This was their home during March 1968. That was, until they headed out on a short tour of Denmark and Sweden. It was during this tour that Roundabout became Deep Purple. It was Richie Blackmore that came up with the name Deep Purple. This was the name of his grandmother’s favourite song. That was the name he wrote on the blackboard, when everyone was asked to choose a new name for the nascent band. Deep Purple wasn’t the favourite though. That was Concrete God. However, the members of Roundabout decided against it. They felt the name was too harsh. So Roundabout became Deep Purple and began recording their debut album in May 1968. Shades Of Deep Purple was released in July 1968 in America. It reached number twenty-four in the US Billboard 200 charts. This was no doubt helped by Hush reaching number four in the US Billboard 100 charts. Two months later, Shades Of Deep Purple reached number fourteen in Britain. For Deep Purple their debut album had been a commercial success and their lives transformed. After the commercial success of the single Hush and Shades Of Deep Purple, Deep Purple were booked into a gruelling tour of America. Their American record company, Tetragrammaton, decided that Deep Purple should record another album. So Deep Purple headed into the recording studio in September 1968 to record The Book of Taliesyn. Just like Shades Of Deep Purple, The Book of Taliesyn was a mixture of psychedelia and progressive rock. The only difference was it had a harder edge. Deep Purple’s trademark sound was evolving. Critics seemed to prefer The Book of Taliesyn. It received a much more favourable reception from critics. This was also the case upon the release of The Book of Taliesyn. Released in December 1968, The Book of Taliesyn reached number fifty-four in the US Billboard 200. Two singles were released in America. Kentucky Woman reached number thirty eight in the US Billboard 100 charts. Then River Deep, Mountain High stalled at number fifty-three in the US Billboard 100 charts. The Book of Taliesyn charted in Canada and Japan. It seemed word was spreading about Deep Purple. However, in Britain, The Book of Taliesyn failed to chart. That wasn’t the only problem Deep Purple would have. By 1969, Deep Purple were becoming a tight, talented band. Onstage and in the studio, they were growing and evolving. This included as songwriters. Although they’d only been together just over a year, they were a much better band. They’d released two albums and toured constantly. There was a problem though. Which direction should their music take? Some members of Deep Purple wanted their music to take on a rawer, harder sound. This didn’t please everyone. Lead vocalist Rod Evans and bassist Nick Simper were in the minority. Organist Jon Lord, guitarist Richie Blackmore and drummer Nick Paice wanted the band to change direction. With the band split, this wasn’t the best way to prepare for the recording of their third album Deep Purple. For Deep Purple, the band were keen to turn their back on cover versions. Deep Purple only featured one cover version, Donavon’s Lalena. The eight tracks were all written by members of Deep Purple. Just like their first two albums, Deep Purple would be produced by Derek Lawrence. Recording of Deep Purple took place during a two-month tour. Deep Purple had ensured they had some free days where they could record their third album during January and March 1969. Recording took place at the De Lane Lea Studio, London. They were familiar with the De Lane Lea Studio. Previously, Deep Purple had rerecorded The Bird Has Flown there. So, they were familiar with the room. This allowed Deep Purple to work quickly. With their reputation in America growing, Deep Purple wanted their eponymous album released as soon as possible. As soon as Deep Purple was recorded, Deep Purple jumped on a plane and headed back to America. They rejoined the tour of the country that had claimed them as their own. There was a problem though. Tetragrammaton, Deep Purple’s American label hadn’t pressed the album. Worse than that, the label had financial problems. Within a year, they would be insolvent and would be filing for bankruptcy. Already, this was affecting Deep Purple. Their manager John Colleta headed home. He decided that this would save on a hotel room. Things it seemed, couldn’t get any worse for Deep Purple. On the release of Deep Purple in June 1969, the album had a harder sound. Elements of blues, progressive rock and heavy metal combined on seven tracks. The exception was The Bird Has Flown. It veered off in the direction of classical music. Mostly, though, Deep Purple’s trademark sound was evolving. How would critics and fans respond to Deep Purple? Given the problems with Tetragrammaton, it’s no surprise that Deep Purple wasn’t a commercial success. Tetragrammaton couldn’t afford to promote Deep Purple properly. Despite generally positive reviews from critics, Deep Purple stalled at 162 in the US Billboard 200 charts. It failed to chart in the UK on its release in November 1969. At least Deep Purple charted in Japan. Things looked up when Deep Purple was certified gold in Germany. That was the only good news Deep Purple enjoyed. The tension that was within Deep Purple bubbled over after the release of their third album. This lead to vocalist Rod Evans and bassist Nick Simper being replaced. In came vocalist Ian Gillan and bassist Roger Glover. Little did anyone realise that this would later, be perceived as the classic lineup of Deep Purple. It was also the lineup that recorded the album that saw Deep Purple make a commercial breakthrough in Britain, Deep Purple In Rock. With their new lineup, Deep Purple Mk II entered the studio for the second time. They made their recording debut on Concerto for Group and Orchestra which was a collaboration between Deep Purple and The Royal Philharmonic Orchestra. However, Deep Purple In Rock was the start of a new era in Deep Purple’s history. Recording of Deep Purple In Rock took place at IBC, De Lane Lea and Abbey Road Studios. A total of seven songs were recorded. They were written by Deep Purple. These seven songs showcased the new Deep Purple. The music was heavier and more like what would be seen as their classic sound. This was essentially hard rock or heavy metal. It was after the success of Deep Purple In Rock that lead to Deep Purple being referred to as the third member of the “unholy trinity of British hard rock and heavy metal. Deep Purple released Deep Purple In Rock on 3rd June 1970. This was Deep Purple’s first album to be released to widespread critical acclaim and commercial success. It was the first Deep Purple album to reach the top ten in Britain. Deep Purple In Rock reached number four in Britain. In America, Deep Purple In Rock only reached number 143 in the US Billboard 200 charts. Elsewhere, Deep Purple In Rock was a huge commercial success worldwide. From Europe to Argentina, America and Japan, Deep Purple In Rock was a huge success. This resulted in gold discs for Deep Purple in America, Argentina, Britain, France and Holland. For Deep Purple, Deep Purple In Rock was a game-changer. Their decision to change direction musically was vindicated. Now, Deep Purple were one of the biggest bands in rock music. Little did Deep Purple realise that they were entering the most successful period of their career. Fireball was the first of three number one albums Deep Purple would have in Britain. Belatedly, Britain had “got” Deep Purple. They were their own, and were proud of that. The hard rocking quintet’s unique brand of hard rock was winning friends and influencing people. Having toured extensively, at last Deep Purple were now part of British rock royalty. This continued with Fireball. Given Deep Purple extensive touring schedule, albums were recorded whenever the band had downtime. Fireball was recorded during various sessions that took place between September 1970 and June 1971. Recording took place at De Lane Lea Studios and Olympic Studios, London. Other sessions took place at The Hermitage, Welcombe, North Devon. During these sessions, seven tracks were recorded. Each of the tracks were credited to the five members of Deep Purple. Unlike other bands, everyone in Deep Purple played their part in the songwriting process. That had been the case since the first album Deep Purple Mk. II had recorded, Deep Purple In Rock. Just like Deep Purple In Rock, Fireball would be a commercial success. Most critics gave Fireball favourable reviews. There were very few dissenting voices. Apart from later, members of Deep Purple. They felt Fireball wasn’t their best album. Record buyers disagreed. Across the world, Fireball was a huge commercial success. Fireball was released in Britain in July 1971. Record buyers in America and Europe had to wait until September 1971. By then, Fireball had reached number one in Britain and was certified gold. Two singles were released in Britain. Strange Kind of Woman reached number eight and Fireball number fifteen. This was just the start of Fireball’s success. When Fireball was released in America it reached number thirty-two in the US Billboard 200 charts and was certified gold. In Canada Fireball reached number twenty-four. Fireball proved one of Deep Purple’s most successful albums in Japan, reaching number sixty-six. Australians were won over by Fireball, when it reached number four. Deep Purple proved popular in Israel, where they enjoyed a top ten album. However, it was in Europe that Fireball burnt brightest. On Fireball’s release in September 1971, it reached number one in Belgium, Denmark, Germany and Sweden. Fireball reached the top ten in Finland, France, Holland, Italy Norway. Despite the widespread commercial success and critical acclaim Fireball enjoyed in Europe, the only gold disc awarded was in Holland. However, Deep Purple would make up for this with their sixth album, Machine Head. By 1972, Deep Purple had established themselves as one of the hardest working bands in music. They seemed to be constantly touring. When they weren’t touring, they were recording. As a result, Deep Purple were about release their sixth album in less than four years, Machine Head. Unlike their five previous albums, Deep Purple didn’t head into the recording studio. Instead, they brought the recording studio to them. They were booked to stay at the Grand Hotel, in Montreux Casino, Switzerland. So that’s where they brought the Rolling Stone’s sixteen track mobile recording studio to. Between the 6th and 21st December 1971, Deep Purple were meant to record their sixth album, Machine Head. However, there was a problem. Lead vocalist Ian Gillan had contracted hepatits. His doctors advised him to rest. For Deep Purple, this was a disaster. The hotel rooms and mobile recording studio was booked. They’d already had to cancel their forthcoming American tour. Cancelling the recording of their sixth album would be an utter disaster. No doubt realising the gravity of the situation, and buoyed by the excitement of starting recording a new album, Deep Purple decided to head to Switzerland. Deep Purple landed in Switzerland on 3rd December 1971. Only one further concert had to take place at Montreux Casino. That was Frank Zappa’s now infamous concert. It took place on the 4th December 1971. During Frank Zappa’s set, an over enthusiastic member of the audience fired a flare. It hit the roof, causing the Montreux Casino to go on fire. Fortunately, nobody was hurt. Unfortunately, the Montreux Casino was in no fit state to double as a makeshift studio. Luckily, the Montreux Casino’s owner Claude Nobs new a theatre nearby that could be transformed into a makeshift studio. So Deep Purple headed to the Pavilion, where they’d record a song based on the somewhat surreal experience at the Montreux Casino. This song would become a classic, Smoke On The Water. For what became Machine Head, Deep Purple had six songs completed. They were all credited to the five members of Deep Purple. So would the unfinished song. It was provisionally titled “Title No. 1.” However, as the five members of Deep Purple spoke about the events at the Montreux Casino, bass player Roger Glover uttered the immortal words “Smoke On The Water.” A classic had been born. During a sixteen day period between the 6th and 21st December 1971, Deep Purple recorded their sixth album, Machine Head. The conditions weren’t ideal. The mobile recording studio was parked outside and cables run through the Pavilion. They ran along corridors and under doors. It was far from the ideal conditions to record an album. Coupled with Ian Gillan’s medical condition, it’s a wonder Deep Purple were able to even record an album, never mind a career defining album. Machine Head was released on 25th March 1972. Reviews varied between favourable to glowing. Although reviews mattered, what counted was sales. There was no problem there. On its release, Machine Head reached number one in eight countries. This included Argentina, Australia, Austria, Britain, Canada, Denmark, France and Yugoslavia. In Holland, Italy, Japan, Norway andSweden, Machine Head reached the top ten. Across the Atlantic, Machine Head became Deep Purple’s most successful album, when it reached number seven in the US Billboard 200 charts. Given the commercial success of Machine Head, it received a plethora of gold and platinum discs. Having reached number one in their home country, Machine Head was certified gold in Britain. Across the English Channel, Machine Head was certified gold twice. In Argentina, Machine Head was certified platinum. However, Machine Head was most successful in America, where it was certified double-platinum. However, this wasn’t the end of the commercial success. Machine Head featured two singles. Never Before was chosen as the lead single in Britain. Although it reached number twelve, this seemed a strange choice. After all, Smoke In The Water was a classic in waiting. It reached number four in the US Billboard 100 charts. It wasn’t until 1977 that belatedly, Smoke In The Water was released as a single, where it reached number twenty-one. How it wasn’t released as a single in 1972, remains a musical mystery. However, having released a career defining album, Machine Head, Deep Purple headed out on their Machine Head World Tour. The Machine Head World Tour would be one of the most gruelling tours Deep Purple had embarked upon. It was scheduled to last the rest of 1972 and into 1973. Deep Purple were a hugely successful band. That’s why music lovers in the four corners of the globe wanted to see and hear Deep Purple. That included in Japan. By August 1972 Deep Purple had arrived in Japan. They’d been popular in Japan for most of their career. However, Machine Head transformed Deep Purple’s fortunes. This included in Japan. On the 15th and 16th of August 1972, Deep Purple took to the stage in Osaka. Then on 17th August 1972, Deep Purple landed in Tokyo. These three concerts were recorded and became Made In Japan. Seven of the songs recorded in Japan made it onto Made In Japan. This includes Highway Star and Child In Time. They were recorded in Osaka on 16th June 1972. From the opening bars of Highway Star, Deep Purple burst into life. It’s the fastest song on Made In Japan. You’re mesmerised by Deep Purple’s performance. The same can be said about Child In Time. It’s a protest song against the Vietnam War is transformed into a ten minute epic. Next up comes a future classic Smoke On The Water. Smoke On The Water was recorded in Osaka on 15th August 1972. It was taken from Deep Purple’s most recent album Machine Head. It’s a defining point in Made In Japan. Featuring some of Richie Blackmore’s peerless guitar riffs. Thankfully these guitar riffs keep on coming. On The Mule, which was recorded in Tokyo on 17th August 19792, a ten second tambourine solo opens the track. It’s a curveball. Soon the organist Jon Lord, bassist Roger Glover and Richie Blackmore combine. When Richie unleashes a spellbinding solo, it lasts a minute. Later, the final three and half minutes see Deep Purple reduced to a quartet. Ian Gillan’s vocal drops out. The rest of Deep Purple cut loose and give a heavy rock masterclass. This continues throughout Made In Japan. Strange Kind Of Woman was released as a single in 1971. This is the third of four tracks recorded in Osaka, on 15th August 1972. It’s an autobiographical story about a friend of Deep Purple who became involved with an evil woman and eventually, married her. The track became a favourite of Deep Purple live. One of the high points of the song is when Richie’s blistering guitar licks and Ian’s vocal duel. It’s akin to call and response, as Deep Purple showcase their inconsiderable talents. The version of Lazy on Made In Japan is different to the version on Machine Head. Recorded in Tokyo, on 17th August 1972, it’s transformed into a ten minute epic. There’s even an except from Hugo Alfvén’s Swedish Rhapsody incorporated into Lazy, as they mix rock and blues seamlessly. Just like the rest of Made In Japan, Richie Blackmore unleashes some peerless guitar licks. All too soon, Made In Japan is over. The closing track is Space Truckin, which was recorded in Osaka on 16th August 1972. That night, Deep Purple played one of the best sets in the Japanese leg of the The Machine Head World Tour. Often, Space Truckin’ closed the show during a twenty minute Magnus Opus. There’s even an excerpt from Mandrake Root incorporated into the track, as Deep Purple take the original track in new and unheralded directions. This allowed drummer Ian Paice and Ian Gillan to take centre-stage. Having said that, every member of Deep Purple plays their part in making Space Truckin’ a success. Especially, that night in Osaka on 16th August 1972. For anyone who couldn’t make the Machine Head World Tour, Made In Japan was the perfect reminder of a legendary tour. Especially the Japanese leg. Between the 15th and 17th August 1972, Deep Purple were at their hard rocking best. This continued wherever they went. However, there were a lot of people who wanted a reminder of this legendary tour. For others, who for whatever reason, couldn’t get to see Deep Purple, a double album entitled Made In Japan was almost as good. So Made In Japan was released in Britain in December 1972 and in America in April 1973. When critics heard Made In Japan, even the most cynical and hardbitten rock critic had to compliment Deep Purple. They were no one of the three best heavy rock bands in the word. Led Zeppelin were the best and Deep Purple and Black Sabbath fought it out for second place. So well received was Made In Japan, that it was heralded as one of the finest live albums ever. Made In Japan further reinforced Deep Purple’s reputation as one of the greatest heavy metal bands. On its release in December 1972, Made In Japan reached number fifteen in Britain and was certified gold. Made In Japan reached number one in Austria, Germany and Canada. In Norway, Made In Japan reached number seven. Then in April 1973, Made In Japan reached number six in the US Billboard 200. For Deep Purple, this resulted in even more gold and platinum discs. Across the word, Made In Japan was a commercial success. After being certified gold in Britain, it was then certified gold in France. Made In Japan was then certified platinum in America, Austria, Germany and Italy. In Argentina, Made In Japan was certified double platinum. Just four years after they first formed, Deep Purple were one of the most successful rock bands in the world. 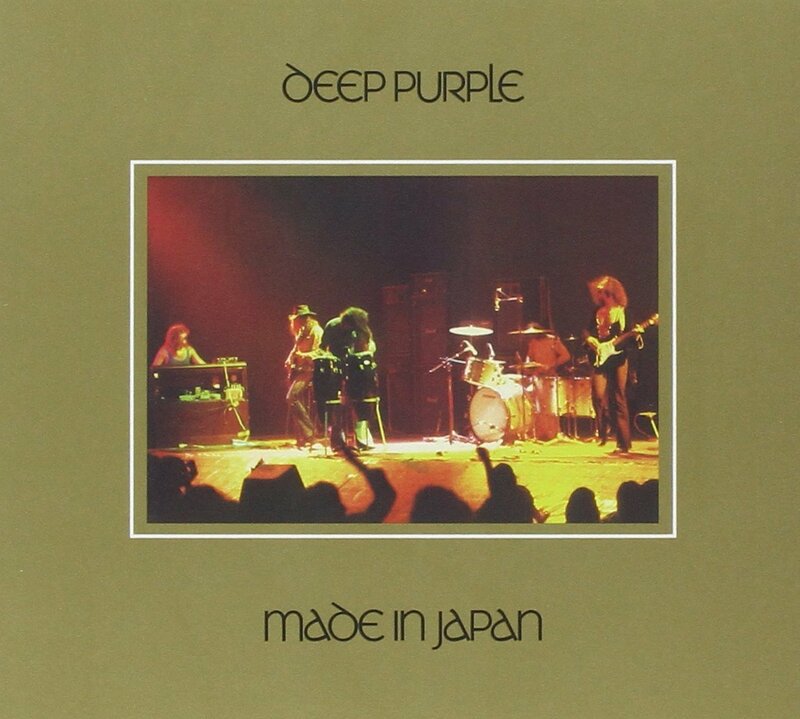 Their 1972 legendary live album, Made In Japan, is a reminder of Deep Purple at their very best. Following Made In Japan, commercial success and critical acclaim continued for Deep Purple. There would also be changes in lineup, breakups and reunions. However, the classic lineup of Deep Purple features on Made In Japan. The classic line up of Deep Purple bid a farewell on 1973s Who Do We Think We Are. Deep Purple’s penchant for the rock ’n’ roll lifestyle was legendary. It came with the territory. This was after all, rock ’n’ roll. Chaos and carnage was omnipresent and expected as Deep Purple toured the world. This never seemed to affect Deep Purple’s music. They were always at their hard rocking, hard living best. A reminder of this is Deep Purple’s first live album Made In Japan, which is one of the finest live albums ever released. Tagged: Deep Purple, Deep Purple In Rock, Fireball, Ian Gillan, Jon Lord, Machine Head, Machine Head World Tour, Made In Japan, Nick Paice, Nick Simper, Richie Blackmore, Rod Evans, Roger Glover, Shades Of Deep Purple, The Book of Taliesyn. ← SPIRITUAL JAZZ 5: THE WORLD.